The Fisher Method Review – Scam System Or Is It Legit? I just want to let you know from the off that I’m not an affiliate of The Fisher Method system, meaning what you’ll be reading here will be an honest, “outsider’s” review. Most other so called reviews are nothing but hyped up BS written by affiliates who are simply attempting to try & get you to buy into the system so that they can earn themselves a commission. Things don’t work like that here, you can rest assured that I’ll only ever recommend something if it’s absolutely proven to work. So what’s this system all about? 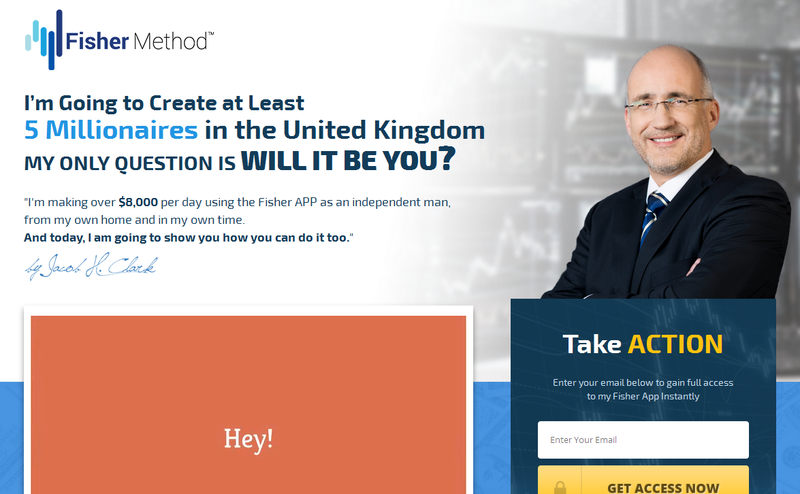 The Fisher Method is supposedly an app which has an inbuilt formula that allows it’s users to make profitable binary trades with ease. Whilst this system itself is brand new, according to the website The Fisher Method itself isn’t, and it’s apparently been used by universities around the world for a very long time. The problem is it’s been too complex for traders to incorporate into their trades, but this app has been developed to take the hard work out of it & create an “autopilot” style approach whereby you can harness the power of The Fisher Method formula with the click of a button. Cool, but does it actually work? I’m always very wary when it comes to “free” binary systems because they’ve built up an extremely bad reputation for making false promises & taking peoples money. Whilst the website of The Fisher Method system looks very professional, I’m still going to approach it with extreme caution because this is also a supposedly “free” binary system, and out of the hundred or so I’ve reviewed I’ve yet to find even just one that works as promised. In fact none of the so called free systems I’ve reviewed to date have managed to put even a single person into profit – all they’ve done is provided false hope & left people out of pocket. So is The Fisher Method any different? You see Sky News archive all of their stories, and by using the search above you can quickly & easily search through their entire website. Guess what? No results about The Fisher Method whatsoever! Alarm bells are ringing already! One thing this system did give away was the name of it’s supposed creator, which was Jacob Clark. The website mentions that Jacob is an honorary Professor of Mathematics & has published 100’s of articles, yet after doing my own research I was unable to find any to backup these claims. I then decided to use Google’s reverse image search on the photo of Jacob Clark, and it turns out that the image is nothing more than a stock photo which is readily available for anybody to use. Does Jacob Clark really exist? I can’t be 100% sure, but the way things are looking my guess is probably not. I think he’s simply a made up character that’s been created to make this system appear more genuine. In order to find out any more about the system you’re required to enter your email address, so for the purpose of this review I did exactly that. After entering my email address I was immediately disappointed. Considering this system is supposed to be free the first thing you’re asked to do is create an account with the broker that they recommend and deposit a minimum of $250. I don’t know about you but that’s certainly not what I call free! The system tries to rush you through the deposit process by telling you that there’s hundreds of people on the page & that you’ll miss out if you don’t get in quickly, but I decided to hold out and do some research first. I’m glad I did! Well the first thing I discovered is that Jacob Clark doesn’t exist, and he is most certainly a made up character to make this system appear more believable/trustworthy. In actual fact this system hasn’t been created by a trader at all, instead it’s been launched by an internet marketer who’s out to make a quick buck – at your expense. The internet marketer that’s launched this system is affiliated with the broker that he ‘recommends’ after you enter your email address. This means that he gets paid a commission each time he gets a new person to sign up and deposit funds (a pretty huge commission too). The only problem is most people know how risky binary option trading is so they’re reluctant to deposit because they know they’ll lose their money. That’s why he created The Fisher Method system, because he knew if he could convince people they could make money he’d be able to get a whole load of people to deposit & earn himself a ton of commissions. Basically this system is nothing but hype & false promises, but you’re only left to discover that AFTER you’ve made your deposit… By then it’s too late – your money’s gone. You see these brokers don’t like offering refunds & the chances of you getting your money back are extremely slim. Basically you may as well wave goodbye to any funds that you deposit because it’s very unlikely you’ll ever see them again. If you think you can just deposit funds to ‘try it’ and withdraw what’s left in your account, think again. It doesn’t work like that. Avoid this system – unless you’re looking for a way to LOSE money, because that’s the only way it will help you. Unfortunately this system is no different to any of the other bogus binary systems that have came before it. To be honest though I don’t really recommend binary trading, in fact I actually strongly advise against it. People online make it look easy but the truth is it isn’t & very few people actually manage to make a profit. At the end of the day trading binary options is nothing more than a gamble, and gambling is no way to build a sustainable income. Just my two cents, but if you’re looking for a way to build a real income online then you need to be looking for an internet marketing system instead. Internet marketing is where the real money is at and at least with internet marketing you can properly scale your business up. Many people seem to think it’s difficult, but it’s actually really easy. I used to be an electrician & didn’t have a clue about computers but I got myself plugged into an IM system & truthfully I’ve never looked back – I’ve been doing it full time for over 2 years and I’ve loved every minute of it! As I said that’s just my 2 cents, it’s up to you what you do but regardless I hope this review was able to help prevent you from parting with your cash into this bogus Fisher Method system. If however you’re too late and you’ve came across this review AFTER depositing then please do share your experience by leaving a comment below, it would be much appreciated.